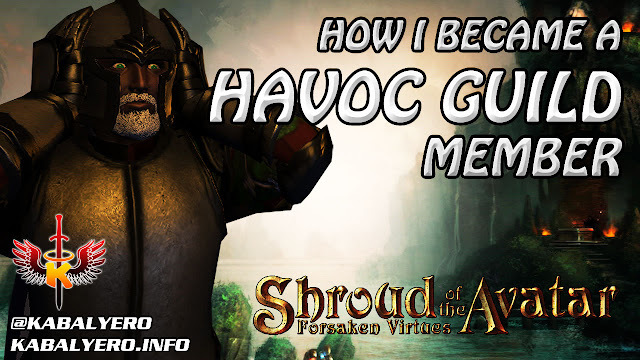 Now, there are a lot of guilds in Shroud Of The Avatar but Havoc was the very first guild that invited me to join. If my memory is correct, it happened in Soltown while I was marching through town and playing a Christmas Song on my Harp. In town, I passed by a beautifully dressed female avatar and, a few seconds later, I received a message from this beautifully dressed female avatar. She asked me if I want to join a guild, the name of the guild is Havoc. I asked the beautifully dressed female avatar if there are any requirements in joining the guild. She said there were none. After that, I said yes in joining the guild, the beautifully dressed female avatar sent me an invite and that is how I became a member of Havoc in Shroud Of The Avatar. I'm not sure if I received any "welcome" messages when I joined because I immediately went AFK (had to go to the toilet) after accepting the invitation and only checked Guild Chat very much later in the day. In any case, it doesn't really matter. I've been playing SOLO since persistence so being in a guild didn't really affect nor change how I play the game. By the way, the name of the beautifully dressed female avatar who invited me to join Havoc is Nim and I would like to thank her for inviting me.